This first volume of David Hare's plays contains his work from the 1970s, including his landmark play of that decade, Plenty, charting the development of 'one of the great post-war British playwrights' (Independent on Sunday). 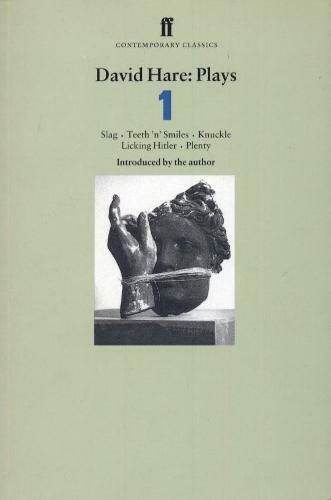 The volume also includes the plays Slag, Teeth 'n' Smiles, Knuckle and Licking Hitler, and is introduced by the author. "An embattled contemporary morality play full of sardonic fun and spiky indignation...What an enviable debut: funny, intelligent and briskly honest." --"Sunday Times"
"The writing is bright with aggression...a flintily intelligent play." --"The Times"
"I beg all lovers of the theatre, and all those concerned for its future, to see "Knuckle."" --"Sunday Telegraph"
"Beginning with a middle-class young woman's unceremonious introduction to specialized war work, it develops with a devastating economy of means into a dramatization of the unarguable logic of deception...elegant, spare and as lucid as crystal." --"Observer"
"Brilliant...it deepens with every viewing." --Mel Gussow, "New York Times"
An embattled contemporary morality play full of sardonic fun and spiky indignation...What an enviable debut: funny, intelligent and briskly honest. "Sunday Times on Slag"
The writing is bright with aggression...a flintily intelligent play. "The Times on Teeth 'n' Smiles"
I beg all lovers of the theatre, and all those concerned for its future, to see "Knuckle." "Sunday Telegraph on Knuckle"
Beginning with a middle-class young woman's unceremonious introduction to specialized war work, it develops with a devastating economy of means into a dramatization of the unarguable logic of deception...elegant, spare and as lucid as crystal. "Observer on Licking Hitler"
Brilliant...it deepens with every viewing. "Mel Gussow, New York Times on Plenty""